Wichita, Kansas is home to the Old Cowtown Museum, today’s “Museum of the Day”. 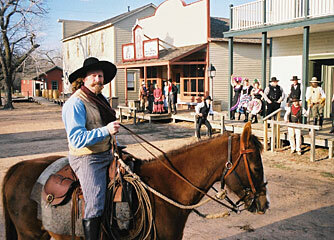 Cowtown is a living history museum where visitors experience life in the 1870s. Immersed in a sampling of the sights, sounds and activities common to a Midwestern cattle town, visitors will experience the dramatic clash of Victorian ideals and economic realities as these competing forces strove to create an economically viable cattle town and a Victorian metropolis. A visit can include a wagon ride, the ring of the blacksmith anvil, and a visit to the humble home of the town’s founder, Darius Munger. The experience here is all “living” history, so visitors walk away with a full-on sense of life in the 1870s. I always enjoy interacting with live actors and will visit this museum when I travel to Kansas!